I am very far from anything like an expert, but people do us cotton as long as it is a very tight weave. Though, personally I wouldn't do it if I had a choice and was making my own as they do crawl on the outside of stuff as much as on the inside. Tightly woven cotton can be used on the outside if the pouch is made so that all raw edges are hidden from the gliders. It is also necessary to check the inside fleece pouch daily because some gliders will dig holes in the pouch to get into the space between the two layers. The danger is that threads can fray from the cotton fabric that might get twisted around a glider's toe or even around an entire extremity. Twisting by a struggling glider only makes this thread tighter and can potentially cut off circulation and cause permanent injury. Gliders have chewed off their own feet to free themselves from an entanglement. I have diggers - I switched to single layer fleece pouches and just throw them out when they eventually get a hole through the fleece. I agree with All of the above. Cotton just doesn't last very long. I think the big temptation is the variety of print and colors. None of mine are diggers but have gone through all my pouches that were cotton on the outside in about 6 months. My all fleece are still intact from a year ago. A lot of people use cotton on the outside of their pouches. If I were to use cotton, I would cut it out with a pinking shears and then stitch it with the smallest stitch my machine can do and go over it twice to keep it together and keep it from fraying. I myself use fleece on fleece unless it is a bonding pouch. Kimberley, what stitch setting do you use on your machine? I have been using 1.4, which is pretty small but I have a few settings much smaller. Though, the needle literally doesn't move on the smallest setting. I have a Brother CS6000i and I use the 1.5 for fleece on fleece. I would use just 1.0 for fleece on cotton. Thank you! I have a Brother E350 and I believe my choices are 1.4 and 1.6. Both are pretty tight. Kimberley, I have another question: What size needle are you using with fleece? I just use the regular needles, nothing special. Thanks for the help. 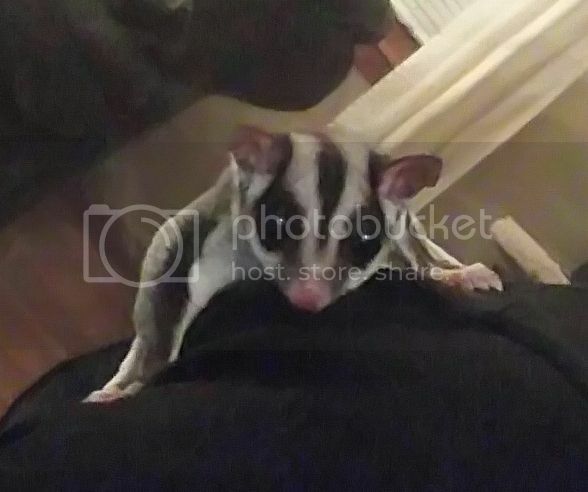 I ordered a 7 piece cage setting from Ebay new of course but it is made specifically for sugar gliders so i'm hoping he can use it, as he would have to wait for yet another order. Be sure to check the stitching on your order when it comes. 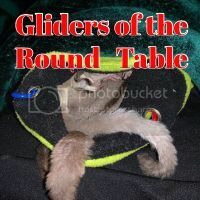 In the past there have been sellers who were really not that familiar with gliders so did not know the dangers of loose stitches. Stuarts cage setting came in and he loves it. When he woke up on Friday evening to find new stuff he started investigating. I added my scented fleece blankets as well as his to the new sleep pouch, hammock, and the tube or bridge. It is an Ed Hardy design. May not look very glider like but my hubby got it because he knows I love Ed Hardy things. It is nice though and seems very well made. He plays on it and has slept in new pouch ever since. He was having to sleep in UNZIPPED of course bonding pouch as that is all I had. Now he has one to sleep in while washing the other, PLUS his seperate bonding pouch. Here is another How To for adding pictures to posts.